The Leadership Committee (LC) of the American Society for Quality (ASQ) St. Louis Section 1304 has elected to discontinue the Herbert V. McMahon Education Grant for the current fiscal year. 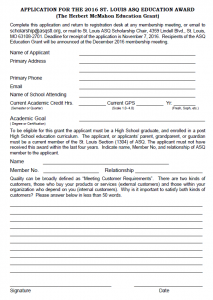 To be eligible for the Educational Grant an individual must be an immediate family member of a St. Louis section member (i.e. son, daughter, stepson, stepdaughter, grandson, granddaughter), or a section member. The individual must also have completed High School, and be enrolled full time in a post High School educational program. Educational grant applications are available at all section meetings and here on the web by clicking on the image to the right. Upon completion of the application you may mail or deliver the application to the Scholarship Chair. All the applications will be reviewed by the Scholarship Chair for acceptability. A final selection will be made by the full Leadership Committee through a random selection from of all acceptable applications. The Education Grant recipient will be notified by mail/email, and the Education Grant will be presented at the regularly scheduled Nov/Dec membership meeting. This Education Grant represents a continued effort by the Leadership Committee to provide a positive benefit for continuing your continued membership in the St. Louis Section of the ASQ. If you have any questions concerning the Education Grant, or the application process please contact the Scholarship Chair or the Leadership Chair at any regular membership meeting.